This feature is configured on the web app level by an ITPro administrator by using PowerShell cmdlets. The list for the custom tiles is provisioned at the root level of the web application so anyone will be able to see or remove the list. The custom tile feature is not enabled by default. To enable the feature, do these steps. You must be a member of the Administrators group on the server on which you are running the PowerShell cmdlet. If these permissions are not satisfied, contact your Setup administrator or SQL Server administrator to request these permissions. For additional information about PowerShell permissions, see Permissions and Add-SPShellAdmin. If the feature is not available, then ensure your SharePoint farm is patched with at least Feature Pack 1 contained in all cumulative updates of SharePoint 2016 of November 2016 and later. To validate this, you can run the following PowerShell command. Your SharePoint build version should be at 16.0.4456.1004 or later. 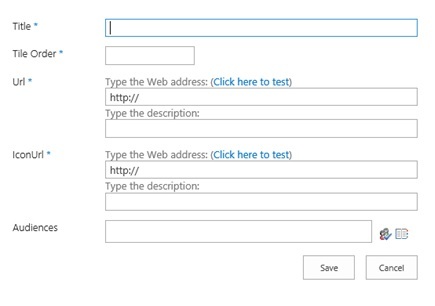 The URL you provide will be the location of where the Custom Tile list is provisioned, so you may need to provide permission access to the list accordingly. Custom Tiles List will be Created on specified URL on feature enable command as hidden list. Since this list is Created as a Hidden List, browse to https://web_app/Lists/Custom%20Tiles/AllItems.aspx to access Custom tiles list. Click new item to add a new item to the list. Enter a Title for the new tile. The name will appear in the tile. Enter a number for Tile Order. This is the order you want the tile to appear after the default three tiles (that is, Newsfeeds, OneDrive, Sites). Enter an IconURL for the tile. The recommended size for an icon is 50×50 pixels, however the thumbnail will automatically scale. The image appears on the app launcher. Type the name of an Audience you want to use this tile. For example, Marketing. List or library items in SharePoint Server can be targeted to appear only to people who are members of a particular group or audience. An audience can be identified by using SharePoint groups, distribution lists, or security groups or by using a rules-based system to create a global audience. After you add a new item in the custom tiles list due to caching, it may take up to 24 hours before you can see it appear in the app launcher. 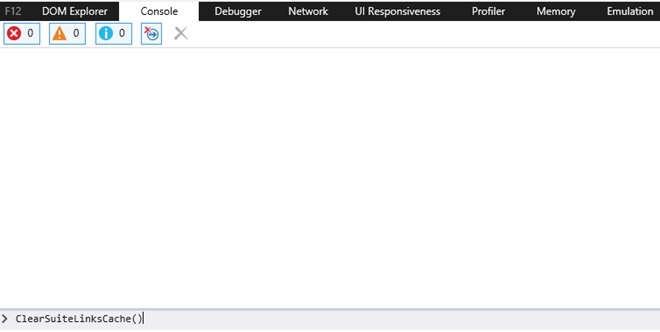 If you want to see it immediately, you can run ClearSuiteLinksCache() function in the developer browser’s console which is displayed by pressing F12 while in a browser session as displayed in the following diagram. The ClearSuiteLinksCache() function is not available in SharePoint Server 2019 and will generate an error if used. After the ClearSuiteLinksCache() function is run, it returns “undefined”. You must refresh the page by pressing F5 or the refresh button on the Address bar of your browser for the tile to now appear in the app launcher. If you want to unhide list of custom tiles you can do this by using PowerShell. The List will be visible when site Contents is viewed. Select Yes for Navigation setting to display list on Quick Launch as displayed with this image.